Coasteering is an exciting cliff-based activity that will thrill you to the core. As part of this high adrenaline activity you will be climbing and swimming around the rugged Cornish coastline, exploring grottos and caves and jumping from the cliffs into the Atlantic ocean. The highlight of this activity has got be the big jumps which can be up to 10m (30 feet) high. All of these are voluntary and you will start off by practising on much smaller jumps. Experienced instructors will lead you around the cliffs and you will be provided with wetsuits, helmets and life jackets. Coasteering is one of the most nerve-tingling activities that you could do during a hen weekend and we guarantee it will thrill, excite and challenge anyone that's brave enough to give it a go! 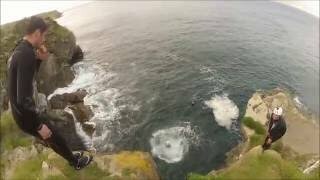 View our Coasteering video and get an idea of what to expect on this activity.